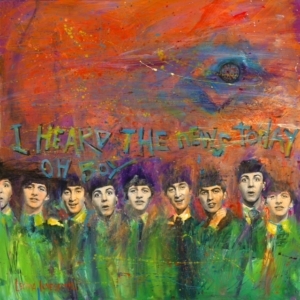 My Beatles Collection also includes a painting based on the Beatles’ song A Day in the Life, which was the final cut on their Sgt. Pepper’s Lonely Hearts Club Band album. Many music experts think A Day in the Life was the greatest of all the songs the Beatles wrote and recorded. 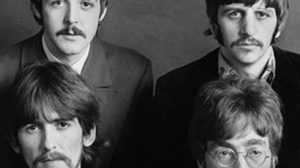 It tops the chart of The Beatles: 100 Greatest Songs, a list that was compiled to coincide with the 40th anniversary of the Fab Four’s final studio album, Let It Be. 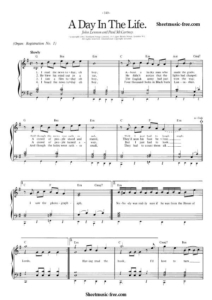 And in 2010, an anonymous American collector purchased John Lennon’s handwritten two-sided lyric sheet for the song (which includes corrections and alternate crossed-out lines) at Sotheby’s auction house in New York for $1.2 million! Rolling Stone Assistant Editor Andy Greene considers the music sheet to be the crown jewel of the Beatles collection. This song has many, many parallels to how I create art. Just like pop music is a reflection of, or commentary on, popular culture, pop art transports images from popular culture into fine art. 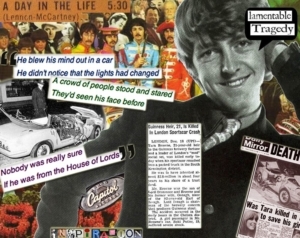 John Lennon wrote the first half of A Day in the Life. He based it on two stories he had read in the Daily Mail newspaper. 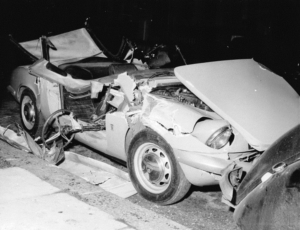 The first was about Guinness heir Tara Browne, who died when he smashed his Lotus into a parked van. The other was an early 1967 article in the UK Daily Express that reported how a road surveyor had counted 4,000 holes in the roads of Blackburn and commented that the volume of material needed to fill them in was enough to fill the Albert Hall. 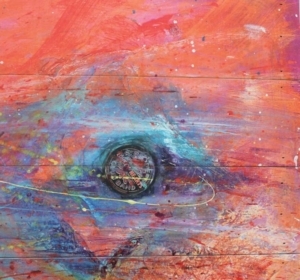 In most cases, my paintings depict one image or a single theme. But there are occasions when I challenge myself to include and reconcile multiple, even conflicting images. Often, these are the most satisfying works that I create. If you think about it, we often combine seemingly contradictory tastes such as spicy and sour or sweet and bitter to create dynamic flavor profiles. John and Paul did exactly the same thing in A Day in the Life, which synthesizes two separate songs into a cohesive whole. The section Paul wrote that starts “Woke up, got out of bed” was intended for another song. When you look at opposite or random objects, your mind naturally looks for some way to unify them so that they make sense. It’s a phenomenon that creates some of the most satisfying surprises in the creative process. Once John and Paul decided to combine two songs that didn’t initially have much to do with each other, they had to find a way to combine them in a way that made sense. And Paul did this by bringing in a 41-piece orchestra to bridge the gap between the two songs. Today, everyone agrees that was sheer genius. I won’t claim that any of the transitions I’ve used in my paintings are “sheer genius,” but I do believe they are inspired by a higher power. And that’s the key in creating anything – tapping into and giving yourself over to that higher power we all have. The last parallel I want to draw to A Day in the Life is that when creating a painting, artists often build their compositions in layers. A Day in the Life was recorded in three sessions. First, the Beatles recorded the basic track. 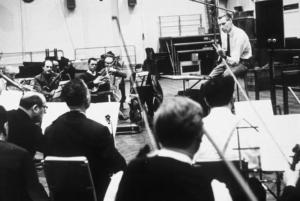 Then they recorded the orchestra. Finally, they dubbed in the last note. In painting, artists often start with a drawing, which they pencil in and then darken with a sharpie. After that, they may do successive washes, building up layers and levels of translucent and opaque pigment. This can be composed solely of oil or acrylic paint, or it can include other materials from newspaper and magazine print and photographs to resins, bees wax and archival ink. Sometimes this process takes a matter of days. At other times, it may last for months or even years. 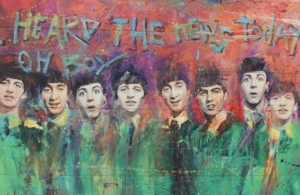 Both original paintings and prints from my Beatles collection are available for purchase at Lovegrove Gallery & Gardens. Give us a call. The number is 239-938-5655.